Eastern University Games 2013 looks like it was a fun time. And if you are a UTS university student, and a volleyballer of any kind, and this doesn’t make you want to get into Australian University Games…then who are you and why are you reading this? Week 3 of SVL out at Homebush on the 30th of June is the last before a break for National Juniors. A chance to go as hard as you can since you won’t have to play next week. How did everyone go? As a result of the long previous games, the div 1 Team started their game versus Sydney Uni an hour late. Although the team hasn’t played in that combination before, UTS had a good start. Because of some good passings, the team was able to set more balls to the middles than in the last two games so that Birgit was successful with a few hard hits. As Sydney Uni hit some balls quiet low, Emily did a great job in blocking them, so UTS won the first set. In the second set UTS was even stronger and 10 points ahead, but needed a few tries to make the last point. Deb made two points, taking a time out at the right time, with the result that Sydney Uni served into the net. Joe showed that we don’t have to hit every ball and made some points with great tipping. Unfortunately, the libero Gemma hurt her ankle, but Clara replaced her well today and dived for many balls. It was a great start in the third set, as Missy could challenge Sydney Uni with some great serves, but UTS didn’t continue that well and struggled with some strong serves from the other side. Although Sydney Uni was far ahead, Deb could motivate the team so that they managed to catch up to a score of 23:23. Div 1 played really concentrated now, but Sydney Uni won that third set 26:24. The fourth set began again successful for UTS, as Claire had some good servings, having a score of 5:0 for UTS. But Sydney Uni closed that gap and their setter made many points with tipping the second ball flat over the net so that the fourth set went to Sydney Uni as well. In contrast to the last two sets, the fifth set had a positive end for the div1 team. After being a few points ahead, div1 couldn’t make that last point again, but finally UTS won 15:12 and could celebrate the third win! In Round 3 we came up against one of our toughest oppositions UNSW and the game proved to be a great contest between two equally strong teams. In the first set we managed to surprise the young boys from UNSW with a 25:19 win. In the 2nd, they came out with more power and reversed the scores to take out the set. The 3rd set was a real point for point battle, with the scores locking at 24:24 and every point after that became a massive struggle for both teams. UNSW eventually took out the 3rd with a 28:26 win. In the 4th set, we came out with more confidence and although we again reached 24:24, this time our team fought hard to win the points that mattered and force the game into the 5th decider with a 26:24 4th set. The fifth set was a real close match, and again it became a point for point battle, with UNSW managing to get in front by a few points and eventually closing out the match. It was disappointing to loose such a close game, but we demonstrated how hard we could play as a team against a tough opposition and we all managed to enjoy the game. 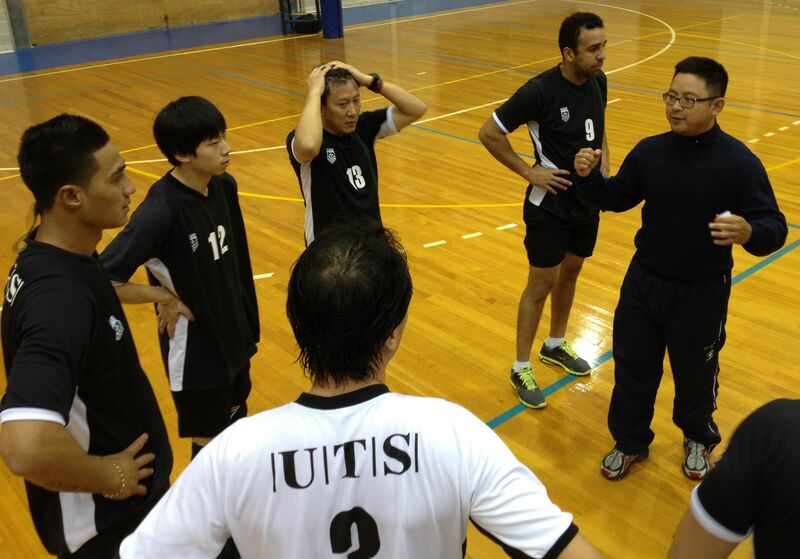 Result: UTS Div 1 Men White defeated by UNSW 2:3, 25:19, 19:25,26:28, 26:24, 12:15. Nam seems like he might be upset by something… The down set maybe? You are currently browsing the UTSVC blog archives for July, 2013.